The Department of Adult and Pediatric Neurosurgery at the University Hospital Saarland offers the full range of services in this medical focus and specializes in the surgical treatment of all diseases of the central and peripheral nervous system in adults and children. The department is headed by Prof. Dr. med. Joachim Oertel. The department has 64 beds, 4 state-of-the-art operating rooms, including an integrated stereotaxic operating room for diagnostic and therapeutic procedures. Treatment is provided by a competent team of surgeons in accordance with the highest standards and recommendations of the professional societies. Prof. Dr. med. Joachim Oertel began his career in 1989 with studying medicine at the Hannover Medical School and at the Harvard Medical School in Boston. After receiving his doctor’s degree, he began working at the Neurosurgical Clinic at the Ernst Moritz Arndt University. After receiving the title of a Medical Specialist and completing habilitation at the Hannover Medical School, in 2006 he took the position of the leading Senior Physician in the municipal hospital Nordstadtkrankenhaus, Hannover. Since October 2008, he held the position of the leading Senior Physician in the Department of Neurosurgery at the University Hospital Mainz. On December 1, 2010, Prof. Dr. med. 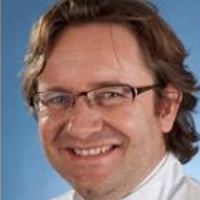 Joachim Oertel was appointed as a Full Professor and Head of the Department of Adult and Pediatric Neurosurgery at the University Hospital Saarland.